Rent Heritage Green | Corporate Events | Wedding Locations, Event Spaces and Party Venues. No matter what your occasion, Heritage Green is an unforgettable venue – full of history, beauty, and charm. Managed by the not-for-profit organization Heritage Sandy Springs, Heritage Green's rental fees support a year-round calendar of free and low-cost programs and community events. The picturesque gardens of Heritage Green create a beautiful ambiance for your special occasion. Located on the lower level of the 1860's style farmhouse, the Garden Room is great for luncheons, showers, meetings, rehearsal dinners, and birthday parties. 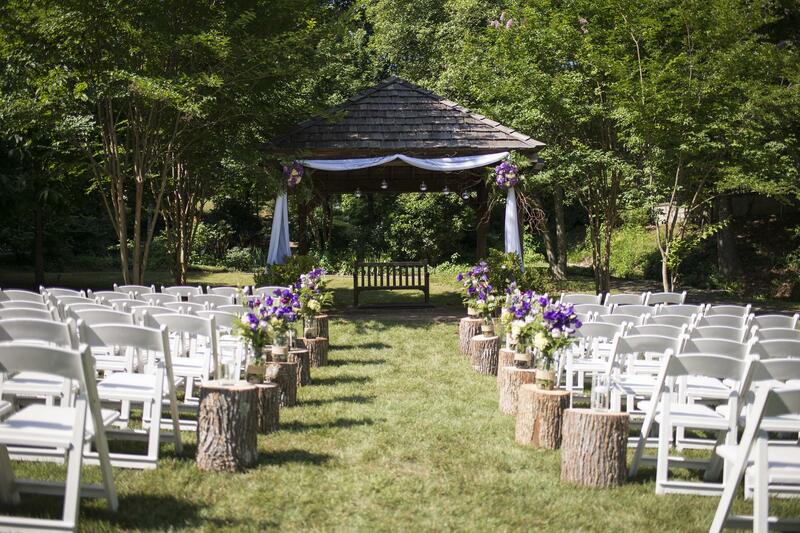 Can accommodate a variety of private events inside the Williams-Payne House and, for larger events, the Garden Room is used in conjunction with the covered brick terrace, lush gardens, and Victorian-style gazebo. Heritage Hall is part of a 3,000 square-foot indoor facility with an on-site catering kitchen, private dressing room, and spacious outdoor veranda. The rustic elegance of Heritage Hall's décor blends seamlessly with our historic gardens and is the ideal event space year-round. 1000 square foot blank canvas that can be transformed to fit your needs. Can be rented alone or in combination with the gorgeous upper level veranda with a beautiful view overlooking Heritage Green. 14,000 square feet of terraced green space suitable for concerts, theatrical performances, outdoor movies, and more. The space is embellished with real stone, blending natural beauty with rustic charm to create a true multi-purpose, outdoor area. With a concrete stage and lawn capacity of 1,000 guests, this space is perfect for a casual or formal setting. At 280 square feet, the Heritage Board Room offers comfortable seating for your intimate gathering. Ideal for corporate meeting or VIP room for a private party.